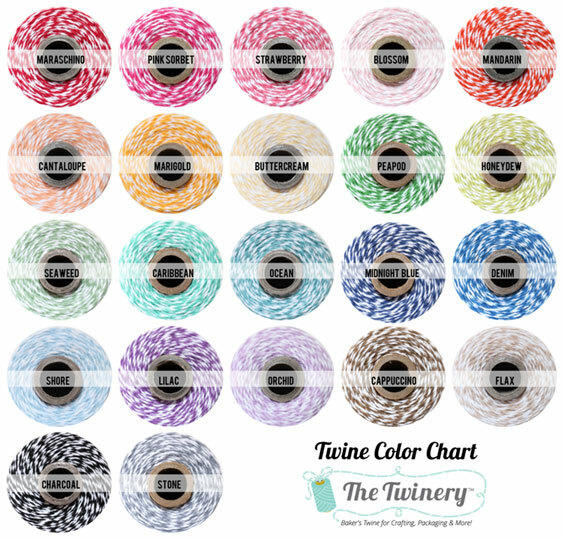 The Twinery: Baker's Twine for Crafting, Packaging & More! The Twinery Twine is made from 100% cotton, biodegradable and made in the USA. Whether you're gift wrapping, crafting or tying up baked goods to give to a friend, this baker's twine adds a fresh, yet nostalgic look to any project at hand! The baker's twine comes in 22 delicious colors and is uniquely twisted against a bright white hue, creating an eye-popping burst of color and a creative embellishment! This twine has lots of color which lends to a fun, candy-striped look. 15 yard packs available in addition to the large 240 yard spools. Free shipping on 15 yard sampler packs! We also have a "Test Pack" which is 2 yards of every color. Great for matching the colors prior to buying full spools.